Riveting Intrigue, betrayal and blackmail... Follow the trail of evil alien Soltan Gris as he continues to plot the destruction of Fleet Officer Jettero Heller and the beautiful, deadly Countess Krak. Now Gris has set sail on his newly acquired multimillion-dollar yacht (it's amazing what you can buy with a "Squeeza" credit card! ), hoping to trap Heller and Krak in a global snare. Of course, the sudden appearance on board of a teenage nymphomaniac and a crazed PR genius puts just the slightest kink in Gris' evil plan. 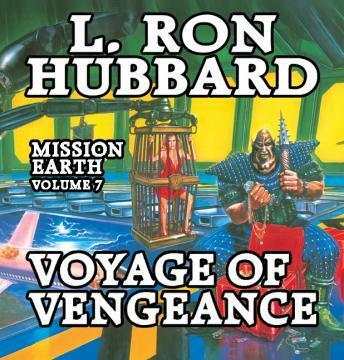 Volume 7 of the biggest Science Fiction dekology ever written -- Mission Earth."... a wildly wicked and deliciously cynical work that mocked virtue, skewered hypocrisy and gave a hilariously satirical view of society." --Kansas City Star"